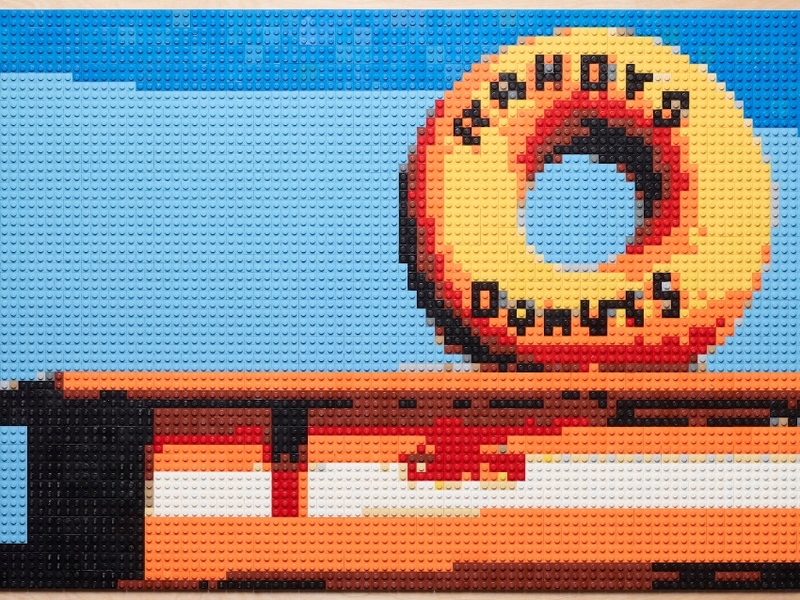 L.A.-based artist Andy Bauch mostly works with Legos. He uses thousands of the plastic bricks to create giant, colorful mosaics with pop-culture references. Some of his latest include depictions of Pink’s Hot Dogs, Helm’s Bakery, and Randy’s Donuts (composed with 5,308 pieces), all of the which are part of Delta Airlines’ newly redesigned SkyClub at LAX. Bauch has been creating Lego art since 2010, when he became obsessed with the medium while working at Disney. His pieces, which can take between 10 to 60 hours to produce depending on their size, are intended to “beckon viewers to question their naturally held assumptions about the validity and merits of digital art” by taking in each pixel and the work as a whole. Bauch’s been exhibiting his art in local galleries and doing commissioned pieces for private collectors for years—his cannon includes portraits of everyone and everything from Hunter S. Thompson to the Santa Monica Pier sign. He says the opportunity with Delta came by way of the Twinhouse Art Advisory, an art consultant based out of Atlanta that he connected with at a recent ArtShare L.A. show. Bauch says he was involved in process of choosing the landmarks, but Delta had the final say of what would be included. And which one did he like best? “I’m proudest of how the Randy’s Donuts piece turned out. Although, I had a really serious hankering for a chili dog the entire time I was working on the Pink’s Hot Dogs mosaic,” Bauch says. You can see more of Andy Bauch’s work on his Web site.